I’m going to participate in the May for Me Celebration this year. Click the button on my sidebar to find out what it’s all about. And, to get started, here’s a post about some playing I’m doing this week. Here’s a little peek at assorted bins of quilty “stuff” on a shelf in my closet. I know, not much compared to some I’ve seen, but I have very limited space to store all the projects, fabric, etc. that come with this obsession of mine. This is just one stash. I’m trying to use this stuff up and move it out. So I chose a bin of 3.5” x 6.5” bricks that I cut up some time ago from some Connecting Threads scraps I had. But I didn’t have a plan for these. I pulled these out and starting putting them together in a brick pattern keeping the colors the same diagonally, if not the actual fabric pattern. I think I like it. I was going to try to make all the diagonal rows match in fabric, but I’m playing fast and loose on this one. My goal is to get all these bricks into a top by the end of May. Then I can free up this bin for one of the many other UFOs stashed around here out of sight and out of mind. This top is destined for a Donation quilt. I’m happy to say I continue to be in the Green when it comes to fabric this year. Wow, over 15 yards used in April. 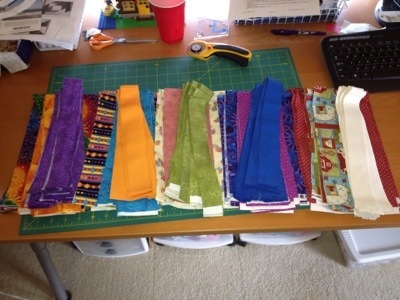 That’s because I made two quilts backs, several bindings, and 3 covers for the topponcino I made for my niece. Those covers used 1 yard each. That was a plus. I did buy 2 yards of a blue that I really like from JoAnns. I had used all I had in my stash and needed more for the Blue Pineapple Blossom that I started for my grandson. I don’t usually buy fabric from JoAnns but there are a couple of staples that I keep around. Stay tuned for Design Wall Monday tomorrow and Getting it Done April on Tuesday. Linking to Judy’s Stash Report. This has been a terrific month for stash usage, which means backings. Lots of backings. Yesterday I finished my Blue Roll Roll Cotton Boll top and got it sandwiched. 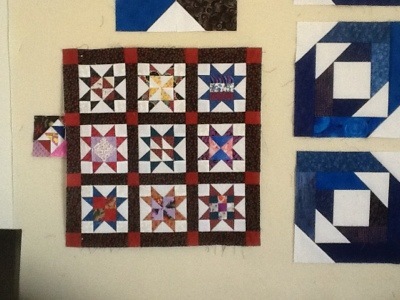 Not sure if I’m up to quilting it today. We’ll see how the day goes. Maybe while watching the 49er’s this afternoon. Linking up to Judy’s blog today. I had to get one last Design Wall post for the year. This is what my design wall looks like today. 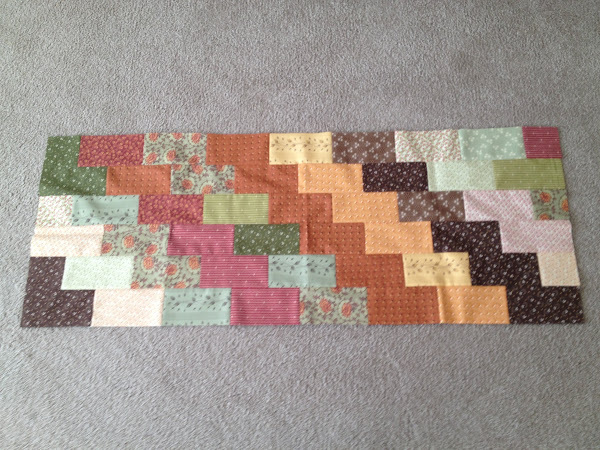 On one side is this table runner that I made with a turnover of the Caroler. I was determined to get this turnover out of my stash before the end of the year. I finally decided what this turnover pack should become. I just made hour glass units by sewing the triangles together into HSTs, pairing up with a different unit, slicing and resewing. Easy. I’m going to call it Hidden Pinwheels because if you look closely, there are a number of complete pinwheels in among the QSTs. On the other part of my design wall is the first step in today’s Easy Street Clue 7. 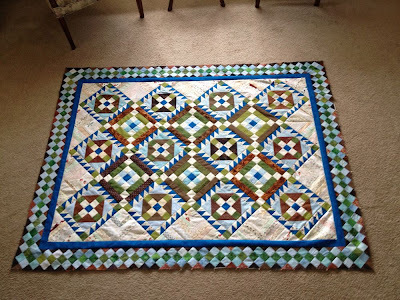 Linking up to Judy’s Design Wall post.